쉽고 빠르게 제공되는 재미있는 뉴스! 현재의 온라인 뉴스 서비스는 많은 뉴스를 빠르게 공급하는 것에 집중합니다. 높이 쌓인 뉴스 더미에서 사용자는 어떤맥락이나 서사를 찾기 힘듭니다. 이야기로서 가치가 없는 뉴스는 그저 재미없는 사실의 나열일 뿐이죠. 만약 여러분이 영화가 시작한 지 1시간쯤 지난 뒤에 팝콘을 들고 자리에 앉는다면 지구를 구하기 위한 히어로의 노력은이유 없는 희생으로 보일 것입니다. 지금 뉴스도 그렇습니다. 맥락 없이 제공되는 단신 뉴스는 재미있는 이야기가 될 수없습니다. 뉴스퀘어는 당신이 놓친 영화의 흐름을 쉽고 빠르게 알려줍니다. 이제 뉴스도 한편의 재미있는 영화가 될 수있습니다. 뉴스퀘어 안드로이드 어플 설정 메뉴의 ‘문의하기' 버튼을 눌러주세요. 열린 마음으로 여러분의 소중한 조언들을 새겨 듣고, 더 좋은 서비스를 위해 노력하겠습니다. 모든 문의사항은 [email protected]을 통해 받습니다. 최대한 빠르고 정확하게 사용자분들의 불편을 해결하도록 하겠습니다. Provide a quick and easy fun news! Many current online news service focused on news in the fastsupply. Piled high in a pile of news users to find any context ornarrative difficult. News stories do not have a value of true isnot listed, just for fun things. If you are the last one hour of starting the movie popcorn andholding back if you have a seat for the hero's efforts to save theplanet without sacrificing will see why. Yes, the news right now.News provided without context alone can not be a funny story. Ifyou missed the film in New Square is easily and quickly tells theflow. Now the news the other hand can be a fun movie. New Square Android settings menu 'Contact Us' button. An open mind and listen to your valuable advice to carve, we willstrive to provide better services. 대한민국을 대표하는 KBS뉴스앱이 새로운 모습으로 변신하였습니다. 오늘의 이슈, KBS뉴스앱이 한눈에 알려드립니다. -이 시각 놓치지 말아야 할 대한민국의 다양한 뉴스들을 이슈와 토픽으로 한눈에 보실 수 있습니다. 당신만을 위한 뉴스를골라드립니다. - 당신의 기사 소비 패턴과 취향을 분석하여 맞춤형 뉴스를 추천해드립니다. - 빅데이터 분석을 바탕으로 한KBS 추천엔진이 당신을 위한 뉴스를 알려드립니다. 모바일에 최적화시켜 더욱 빨라졌습니다. - 간편한 좌우 스와이핑으로다양한 뉴스를 빠르게 보실 수 있습니다. - 동영상이 자동으로 재생되어 클릭 없이 바로 뉴스를 시청하실 수 있습니다.다른 곳엔 없다, KBS뉴스앱에만 있다. - 모바일 전용 동영상 콘텐츠만을 엄선한 '동영상 뉴스' 패널을 선보입니다. -크랩, 고현장 등 고품격 KBS디지털 오리지널 브랜드 콘텐츠를 'TV엔 없다'에서 확인해 보세요. [선택적 접근권한 상세안내] - 사진찍기 및 동영상 녹화 : 제보시 사진이나 동영상을 촬영하여 첨부하기 위한 권한 - 전화걸기 및 관리 :제보시 또는 콘텐츠의 전화번호를 클릭해 바로 전화를 걸기 위한 권한 - 사진, 미디어, 파일 엑세스 : 제보시 기기에저장된 사진이나 동영상을 첨부하기 위한 권한 - 기기의 위치정보 : 해당 지역의 날씨정보를 제공하기 위해 기기의위치정보를 접근하는 권한 * 위 기능 모두 선택적 접근권한으로서 동의하지 않아도 서비스의 이용이 가능합니다. [위치정보접근권한에 대한 상세 안내] 해당 지역의 날씨를 제공하기 위해 위치 정보만 접근하며 개인 식별이 가능한 기기정보등은전송/저장 되지 않습니다. * 위치정보 또한 선택적 접근권한으로서 동의하지 않아도 앱 사용이 가능합니다. 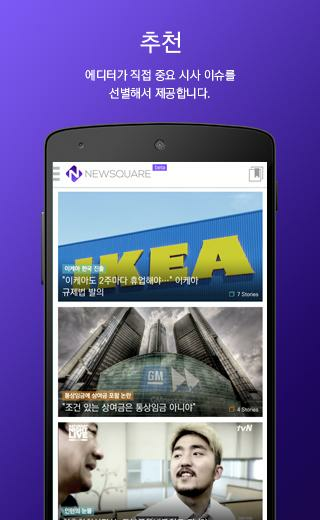 The KBSNews app, which represents Korea, has become a new look. Today'sissue, KBS News app at a glance. - You can see variousnews of Korea which should not be missed at this glance as issuesand topics at a glance. We will pick up news for you only. - Analyze your article consumption patterns and tastesto recommend customized news. - KBS recommendationengine based on big data analysis will let you know the news foryou. Optimized for mobile and faster. 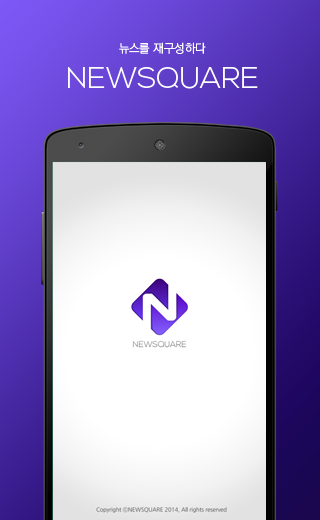 - You can seevarious news quickly with easy left and right swiping. - The video plays automatically and you can watch thenews immediately without clicking. 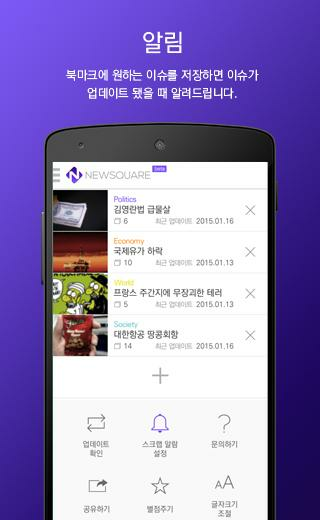 There is no other place, only inthe KBS News app. - We present 'Video News' panel,which is only selected for mobile contents. - Check outKBS digital original brand contents such as crab, high spot, etc.in 'No TV'. [Detailed Information on Optional Access Rights] - Takepictures and record videos: Permission to shoot and attach picturesor videos when notified - Calling and management: Permission tomake a call by clicking on the notification number - Access tophotos, media, files: Permission to attach photos or videos storedon the device when notified - Location information of the device:Permission to access location information of the device to provideweather information for the area * All of the above functions areoptional access rights. [Detailed information on location accessauthority] Only location information is provided to provide weatherfor your location. Personal identifiable device information is nottransmitted / saved. * Location information is also optional andyou can use the app without your consent. 정직한 사람들이 만드는 정통 시사 주간지 《시사IN》을 다양한 스마트 기기에서 볼 수 있습니다. 이 앱을 통해 언제어디서나 주간지 《시사IN》(시사인)과 《시사IN북》(시사인북) 콘텐츠를 즐길 수 있습니다. ■ 메뉴 안내 • 서점 :주간지 《시사IN》과 《시사IN북》에서 출간된 전자책을 볼 수 있습니다. • 내 서재 : 구매한 책들이 진열됩니다. •정기구독 : 디지털 주간지 《시사IN》을 구매 할 수 있습니다. • 라이브 : 《시사IN》 온라인 기사를 볼 수있습니다. • 구매도서 : 구매한 책들을 볼 수 있습니다. 구매도서의 책들은 언제든지 클라우드를 통해 구매복원 할 수있습니다. ■ 이용 안내 • 한 번 구매한 책은 서점 하단 “구매 복원” 버튼을 통해 다시 다운로드 할 수 있습니다. •문의사항은 앱 내 '고객지원'([email protected])이나 북잼 고객센터(1544-9101)로 연락주시기바랍니다. ■ 필수 접근권한 상세 - ID: 인앱 구매 절차를 위해 필요합니다. - 저장공간: 사진, 파일 등 기기 내저장공간을 사용이 필요합니다. - Wi-Fi 연결 정보: Wi-Fi 사용 설정 여부, 연결을 위해 필요합니다. - 기기ID: 구매 내역을 관리하기 위해 필요합니다. ■ 이 앱은 북잼에서 제작되었습니다. ---- 개발자 연락처 : 서울시중구 중림로27 가톨릭출판사빌딩 신관3층 시사IN www.sisain.co.kr [email protected] The "suggested IN" authentic magazine makes the honestpeople can be found in a variety of smart devices. This appanytime, anywhere through weekly "suggests IN" (sisain) and enjoy a"suggested IN Book" (North sisain) content. ■ Menu guide •Bookstore: You can view the weekly e-books published by "INPreview" and "Preview IN Book". Will be on display are purchasedbooks: • My Library. • subscription: digital magazine, you can buya "suggested IN". • Live: You can see the "Preview IN" onlinearticles. • Buy books: You can view the books you have purchased.Purchase of books Books can be restored at any time purchasethrough the cloud. ■ Use guide • Once you have purchased the bookcan be downloaded again from the bottom of the "Restore Purchase"button bookstore. • For inquiries, please contact the app withinthe 'Support' ([email protected]) or bukjaem Customer Center(1544-9101). ■ Required Restrictions Details - ID: The need for anin-app purchase. - Storage: You need to use your storage device,such as photos, files. You need to use Wi-Fi settings, Connection:- Wi-Fi connection information. - Device ID: You need to manageyour purchases. ■ This app is designed in bukjaem.